Title The / Holy Bible, / Translated from / The Latin Vulgate: / Diligently Compared / with the Hebrew, Greek, and Other Editions in Divers Languages. / The / Old Testament, / First Published by the English College at Douay, A.D. 1609. / and / The New Testament, / First Published by the English College at Rheims, A.D. 1582. / with / Useful Notes, / Critical, Historical, Controversial, and Explanatory, / Selected / from the Most Eminent Commentators, and the Most Able and Judicious Critics. / by the Rev. Geo. Leo Haydock. / Enriched with Twenty Superb Engravings. / Manchester: / Printed and Published by T. Haydock, at His Original Catholic Publication Warehouse, / 2, Stable-Street, Lever's Row. / 1811. Contents The complete Bible in the Douay Version as revised by Challoner and later by MacMahon, with extended annotations by Fathers George Leo Haydock (1774-1849), Benedict Rayment (1764-1842) and others. 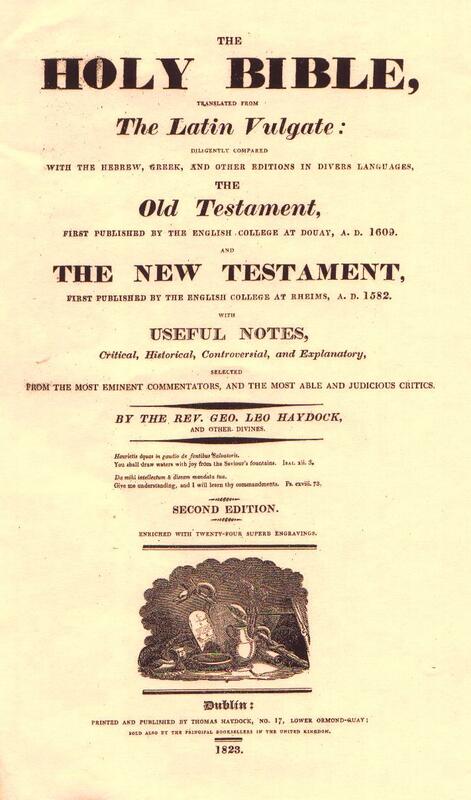 Comments First edition of the long-running series of "Haydock" Bibles, known for the name of the two brothers primarily responsible for producing it: George Leo Haydock, who edited the annotations to the Old Testament and Thomas Haydock, publisher of the earliest editions. Actual production was by subscription over the years 1811 through 1814. 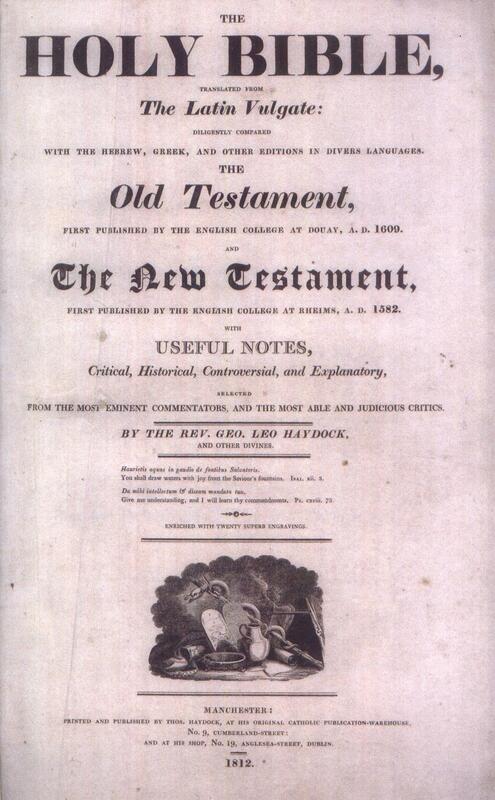 The separate titles to Volume II (starting at Isaias) and the New Testament have different dates of 1812-1815. Recent Sales A copy of this edition sold on Ebay March 28, 2014 for $2,750 (Ebay No. 400685354013). Title The / Holy Bible, / Translated from / The Latin Vulgate: / Diligently Compared / with the Hebrew, Greek, and Other Editions in Divers Languages. / The / Old Testament, / First Published by the English College at Douay, A.D. 1609. / and / The New Testament, / First Published by the English College at Rheims, A.D. 1582. / with / Useful Notes, / Critical, Historical, Controversial, and Explanatory, / Selected / from the Most Eminent Commentators, and the Most Able and Judicious Critics. / by the Rev. Geo. Leo Haydock, / and Other Divines. / Enriched with Twenty Superb Engravings. / Manchester: / Printed and Published by T. Haydock, at His Original Catholic Publication Warehouse, / No. 9, Cumberland-Street: / and at His Shop, No. 19, Anglesea-Street, Dublin./ 1812. 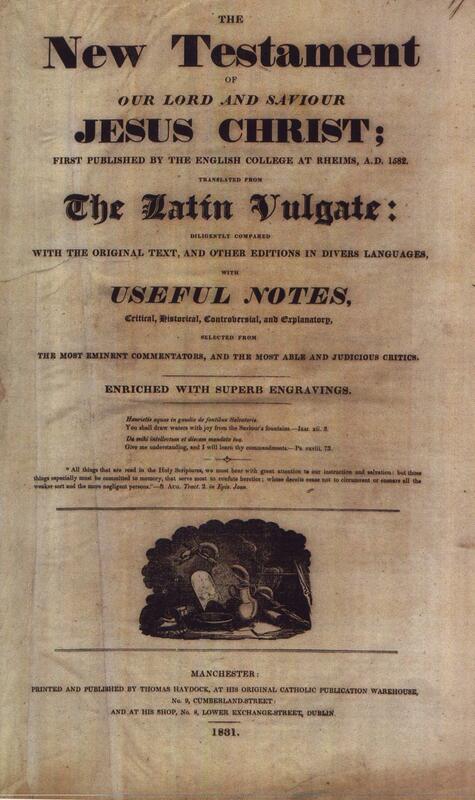 Comments Called the "Second Edition" in some sources, this edition simply has a new title page used on copies that were still in production (the edition was not completed until 1814). Note that after Haydock's name the reference "and Other Divines" appears. 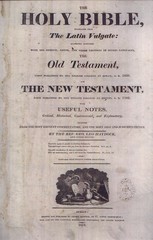 The production schedule proved too rapid for George Haydock to complete all the annotations by himself, so an associate Benedict Rayment and others were called in to complete the New Testament annotations. Recent Sales A copy of this edition sold for $2,250 including buyer's premium on January 7, 2017, at National Book Auctions (Lot 6246), also reported on Ebay (Ebay No. 201768504166). A copy lacking the plates and maps sold on October 26, 2017 for $1,053 on Ebay (Ebay No. 202085960568). Title The / Holy Bible, / Translated from / The Latin Vulgate: / Diligently Compared / with the Hebrew, Greek, and Other Editions in Divers Languages. / The / Old Testament, / First Published by the English College at Douay, A.D. 1609. / and / The New Testament, / First Published by the English College at Rheims, A.D. 1582. / with / Useful Notes, / Critical, Historical, Controversial, and Explanatory, / Selected / from the Most Eminent Commentators, and the Most Able and Judicious Critics. / by the Rev. Geo. Leo Haydock, / and Other Divines. / Enriched with Twenty Superb Engravings. / Dublin: / Printed and Published by Thomas Haydock, No 17, Lower Ormond-Quay; / Sold also by the Principal Booksellers throughout the United Kingdom. / 1813. Title The / Holy Bible, / Translated from / The Latin Vulgate: / Diligently Compared / with the Hebrew, Greek, and Other Editions in Divers Languages. / The / Old Testament, / First Published by the English College at Douay, A.D. 1609. / and / The New Testament, / First Published by the English College at Rheims, A.D. 1582. / with / Useful Notes, / Critical, Historical, Controversial, and Explanatory, / Selected / from the Most Eminent Commentators, and the Most Able and Judicious Critics. / by the Rev. Geo. Leo Haydock, / and Other Divines. / Second Edition. / Enriched with Twenty-four Superb Engravings. / Dublin: / Printed and Published by Thomas Haydock, No 17, Lower Ormond-Quay; / Sold also by the Principal Booksellers throughout the United Kingdom. / 1823. References North West Catholic History, Vol. 40, p. 27 (2013). Comments Recently discovered "Second Edition" not mentioned in standard bibliographical accounts of Bible editions. Despite the reference to "Second Edition," this is not actually a new edition. Only the title page is new. Title The / New Testament / of Our Lord and Saviour / Jesus Christ; / First Published by the English College at Rheims, A.D. 1582. / Translate from / The Latin Vulgate: / Diligently Compared / with the Original Text, and other Editions in Divers Languages, / with / Useful Notes, / Critical, Historical, Controversial, and Explanatory, / Selected from / the Most Eminent Commentators, and the Most Able and Judicious Critics. / Enriched with Superb Engravings. / Manchester: / Printed and Published by Thomas Haydock, at His Original Catholic Publication Warehouse, / No. 9, Cumberland-Street: / and at His Shop, No. 8, Lower Exchange-Street, Dublin. / 1831. 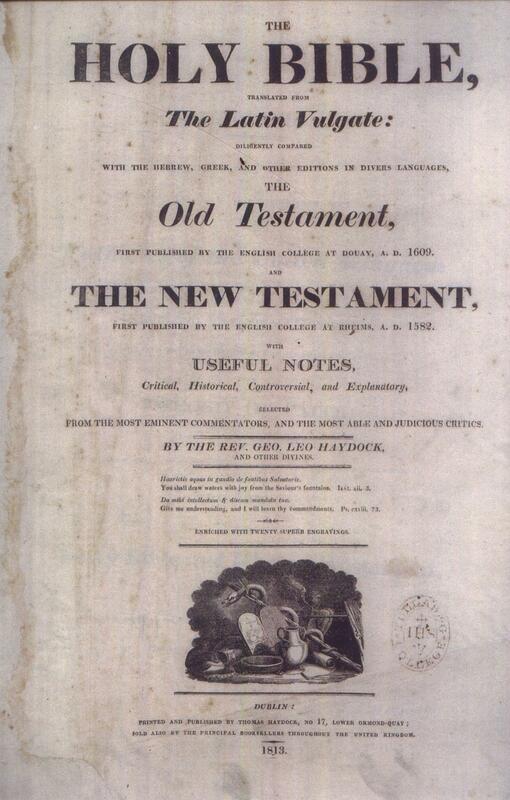 Contents The New Testament in the Douay Version as revised by Challoner and later by MacMahon, with extended annotations by Benedict Rayment (1764-1842) and others. 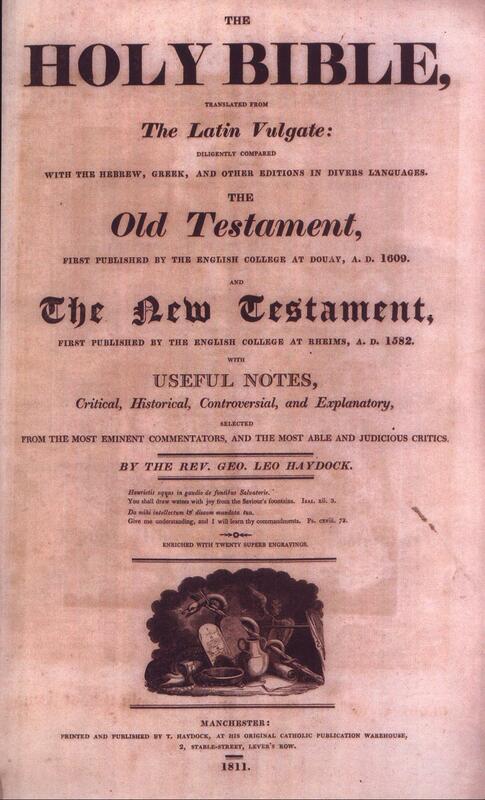 Comments Note that George Leo Haydock is not cited as author of the annotations to the New Testament text. Since the names of Rayment and his associates never appear in any Haydock editions, their contribution was forgotten over time, and George Haydock is often the only one credited.